Country & Townhouse Magazine are treating us this year to an extensive gift guide. 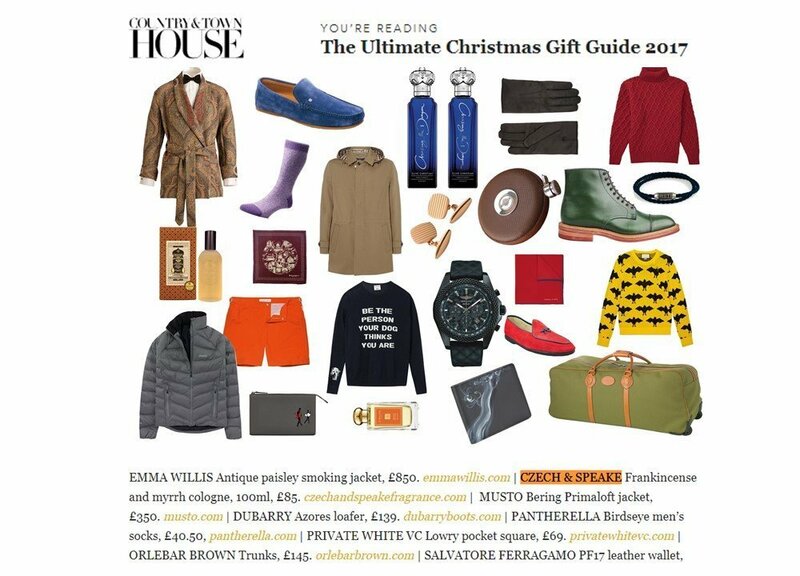 The guide is divided by categories and we are included in Christmas gifts men edition. Among the pajama set, socks and cozy sweaters, we find our Frankincese & Myrrh Cologne, dubbed Christmas in a bottle. The cologne is well known for the rich blend of warm frankincense, topped by the fresh scents of orange, lemon and basil. Thus, the incense, orange and basil remind many people of Christmas time which makes it the perfect scent for the holidays. Also, the 100 ml cologne comes in a discreet etched glass bottle, with a frost effect. Therefore, if you head out to the website of Country & Townhouse you can find the different other guides that they divided by. Find gifts for him or her, for the kids or for the home.